Seven years ago, the browser wars seemed all but ended. AOL bought out Netscape, Microsoft Internet Explorer dominated the market, and the era of browser-based exploits began. In 2003, Microsoft's stranglehold on the browser market didn't change much, but the Mozilla group began their efforts at an open-source alternative. It still took almost two years before we finally saw the birth of Firefox, the first serious contender to the browser throne since the passing of Netscape… okay, so Netscape was more on life-support, but let's not argue semantics. What we are going to look at today is the impact of your choice of browser on battery life, plain and simple. Except, coming up with a benchmark is neither plain nor simple. We have used several different methods for testing battery life on laptops, and depending on the type of content you're viewing battery life ranges from nearly equal to what you can expect at idle down to roughly the same amount of battery life you would get when viewing high-definition videos. Like it or not, we feel that Adobe's Flash is used on many websites, and so we picked three websites that we frequently visit and used those for our testing. As a point of reference, here's the sort of battery life difference you're looking at when viewing "simple" webpages versus the three websites we selected, from our article comparing AMD and Intel battery life. Obviously, that's a huge difference in battery life. You get roughly 50% more battery life in simple Internet surfing compared to surfing sites that use of lots of Flash content (along with frames, numerous tables, etc.) Last we checked, your average website is nowhere near what would qualify as "simple", and Flash content is ubiquitous. For better or for worse, we're going to focus on battery life when viewing three websites. One of the websites is AnandTech.com, and the other two shall remain nameless. Suffice it to say, all three sites have approaches to web design that we see replicated all over the Internet. For testing, we load the three sites into tabs on our test web browser, wait 60 seconds, and then reload all three tabs. 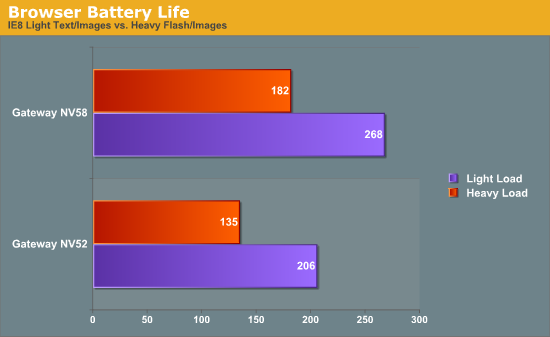 We are using three recently tested laptops that offered decent battery life. Two of these are the Gateway NV52 and NV58 that represent the current state of entry-level AMD and Intel laptops. The third is a netbook, the ASUS Eee PC 1005HA. None of these laptops would qualify as high-end solutions, mostly because we don't think users interested in battery life are going to be looking at high-end laptops. These three laptops provide a reasonable view of the current mobile market. If there is interest, we may look at extending this testing to other laptops in the future, but first let's see what sort of results we get from the test candidates. Adblock doesn't just help by blocking flash but also by preventing tons of scripts the adcompanies run I bet, you should test that by also trying it with flashblock instead of adblock if you want to be sure. I just installed Safari 4 a few days ago along side Explorer 8. Then I saw this article, and when I saw the large difference between IE8 and S4, I decided to test out how much processor usage they each used. So I closed out IE8 and loaded the article up in S4 and found that both cores on my T5500 CPU went from ~5% to over 20% usage on the same page. S4 pages seemed to look nicer than on IE8, and the performance seems a little better too. S4 also has a TSR spellchecking feature enabled by default, and puts borders around text boxes. All these things, and there are probably still more default processes, require CPU cycles to execute. I'd love to see the different power usage differences between XP, Vista and Win7. Maybe you could test different OS's on older and new laptops, as well as older and newer desktops then compare the differneces. It could even be combined with different browsers, and see how each browser interacts with each different OS. I've heard someone say that actually XP is the most efficient power wise when they did an impromptu test of their own, but not sure whether it's really true. Thought provoking piece. Also enjoyed your many well argued riposts to the various trolls here. Nicely done. I quite enjoy the people who won't accept that IE8 is better at power saving than other browsers simply because they don't like it. Interesting experiment. Unfortunately, the article does not help us determine which is the more efficient browser. Lowest power usage DOES NOT equal most efficient! "Work done per watt" is actually the metric we're interested in. "Work" being defined as the number of web pages you can load per watt (multiplied by the load time to get the power usage). Consider this. If IE8 lets you run 10% longer, but Chrome gets you 40% more page views during the total runtime, it's rather obvious that Chrome would still be the most efficient choice.